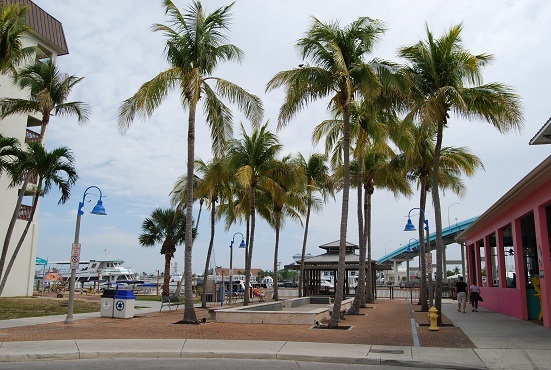 Ft Myers Beach’s downtown district is divided into several sections. 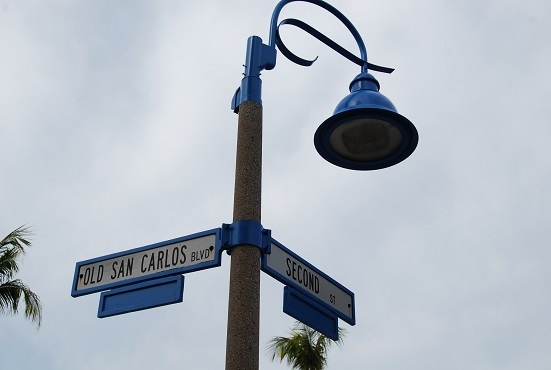 There is the Estero Blvd that travels the length of the island – north to south, Time Square which leads out to the pier, and Old San Carlos Blvd. In 1921 a toll bridge was established to bring visitors to and from Crescent Beach – known now as Estero Island and Ft Myers Beach. 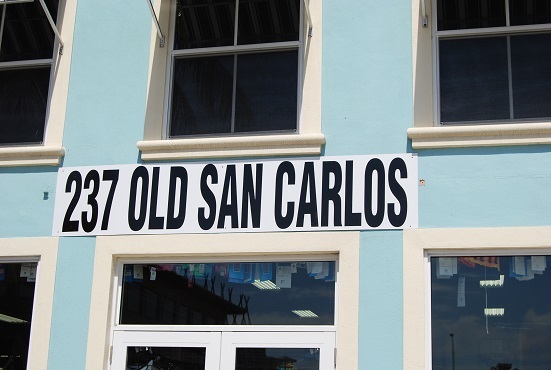 Even though ‘Old San Carlos Blvd’ wasn’t established as of yet, its early beginnings show a definite difference between the town’s older and newer areas. Crescent Beach’s tourism was short lived when SW Florida experienced two devastating hurricanes in the circa 1920’s. This halted construction and the area fell into a quiet depression. The island came alive again in the 1950’s bringing hotels, 2 casinos, restaurants and a swing bridge to handle the traffic. This marked the beginning of Crescent Beach’s transformation. 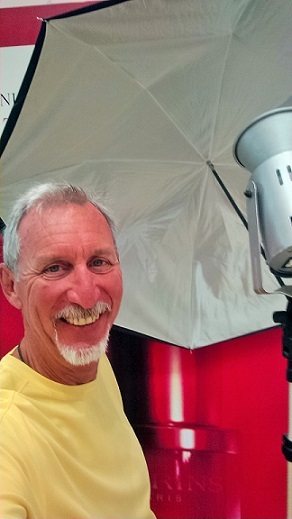 My name is Anthony and I will be guiding you down Old San Carlos Blvd with recent photos, a TTL video, and landmark descriptions throughout the article. 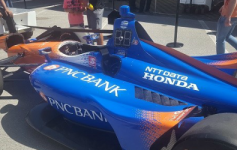 Let’s start at the back bay – Matanzas Pass, and work our way towards Time Square. At the east end of OSCB is a gazebo like structure that looks directly at the pass. 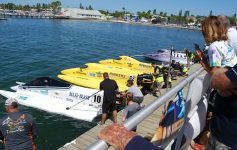 Its a great place to watch the boats go by and if you’re lucky, every once in awhile dolphins will show up. The palm tree lined area provides places to sit and relax or visit with friends and family. Musicians play here during special events throughout the year. 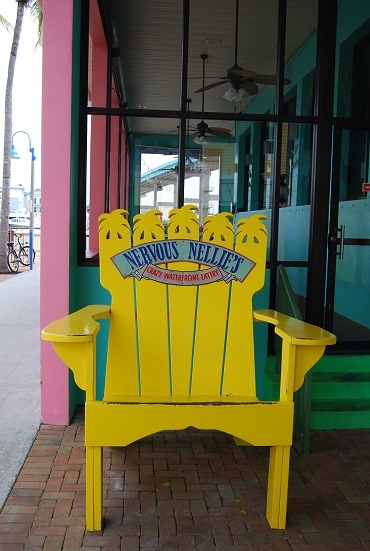 Nervous Nellie’s is a popular restaurant and bar that sits right next door. 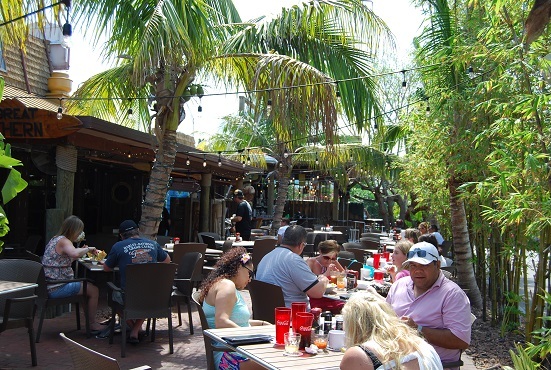 The lower section has a fabulous waterside patio that serves food and refreshing beverages. They also offer free docking privileges when visiting the establishment. Nervous Nellie’s also has an upstairs bar & grill – Ugly’s, that offers amazing views through a wall of windows. It too has a patio that looks out over the Matanzas Pass and the mouth of the Gulf. During shrimp season, you can watch the shrimp boats navigate their way in and out of the back bay’s narrow channel. It is quite a sight! 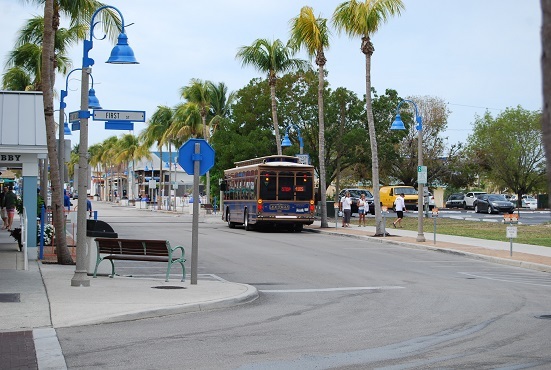 Many of the island’s visitors and locals alike utilize the trolley system. 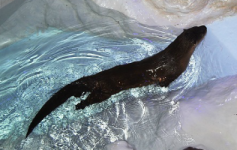 It runs the length of the island – north to south. The alternative is to drive your own car. Parking is limited and can be rather expensive. The trolley charges 75 cents per person and does offer day and weekly passes. This is a great way to get around and kids love it. 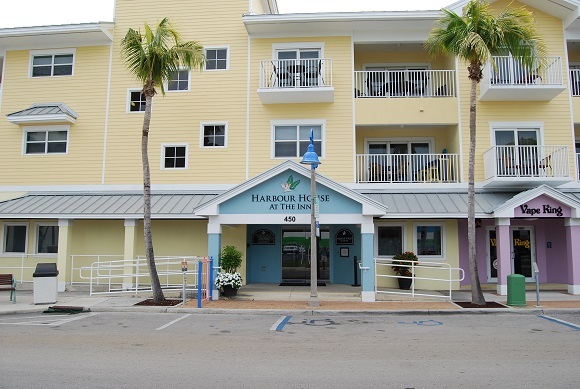 The Harbor House at the Inn is one of several places where you can stay when wanting to be near the water. It sits right on OSCB and is just minutes away to many restaurants, bars, shops and other outdoor attractions. You can enjoy such food venues like the Smoking Oyster Brewery – a.k.a. SOB’s, Fish House, and the Yucatan Beach Stand to mention a few. 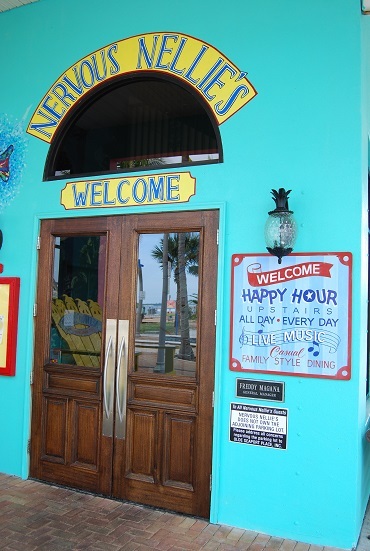 Most the establishments offer in and outside dining with live daily entertainment. Fun can be had at any of them! 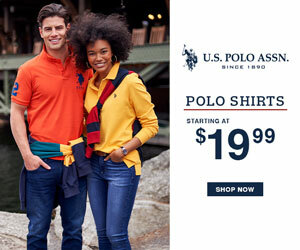 There are plenty of shops to explore when looking for that special souvenir or t-shirt. 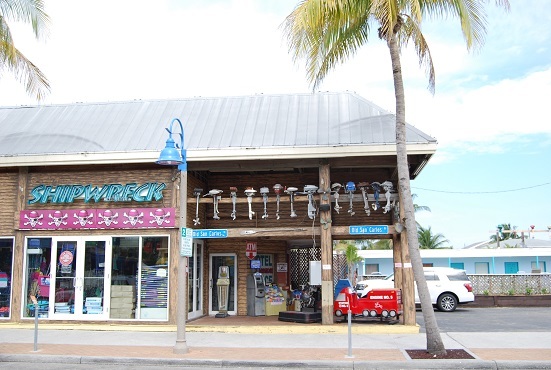 There are some very unique store fronts (shown – Shipwreck) where the owners get very creative. They go from having antique boat motors hanging over the entrance to having a pirate statue greet you as you walk through the door. The following true-to-life video will give you more of an idea what Old San Carlos Blvd is truly like. I really think you will enjoy my adventure down one of Ft Myers Beach’s most popular boulevards. Stay tune for the sequel. It will highlight this small beach side community’s Time Square and local pier. Love, Laugh & Travel Lots!